Sometimes when a piece of metal has been exposed to the elements for 10 years or more, there develops a certain “cancer” in the metal itself. This oxidation can continue threw the entire frame work practically unnoticed by the rider. And so this is the problem with the Dead Ped. Do to the previous owner leaving the scooter on the street in the snow and ice and salt trucks coming by there has developed a weakness in a few key structural components of the scooter. The Fork is the first one I noticed, I saw an area where it looks as it the paint had a crack in it, as I chipped away at it I noticed that the paint just flaked off like the crust of bread. The fracture ran all the way down from the weld where the fork meets the steering steering column. The other spot I noticed is where the shock meets the frame in the rear, it too has a nice sized crack in it, and it is just a matter of time until the weld breaks. Taking these factors into account, I had decided to retire the scooter. I found another under a bridge. I had to fight many of trolls to retrieve it but it was worth the effort. 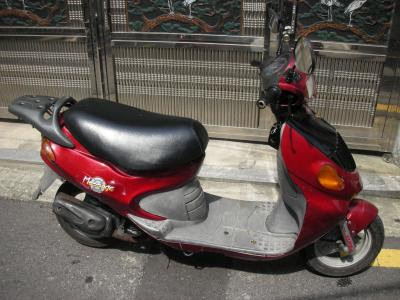 The Daelim Message 50cc. This was probably the diamond in the ruff I was looking for, Most of the electronics had been yanked out of the battery box, and it was covered in a thick layer of Dirt, Road Grim, and grease, But most importantly, it was out of the rain and the snow. And it cleaned up rather well, It was originally used for Pizza/Food Delivery for a restaurant that has since been shut down do to “progress” for the new part of the city. After pushing the scooter for about 1 kilometer I made it to the scooter repair shop. I know this fellow that does not speak a lick of English, but he loves Kimbop, (which is like a seaweed taco). So after a beer and some chow we got to work. We took the Starter Relay, and 90% of the electronics from the Dead Ped and installed them on the Message. And after hooking up all the wires properly the scooter has full use of lights, signals horn and even an electric start! God how I miss electric starters. After a few more tweaking of the system, he took the bike around the curb and down the road to test it out. For 50cc its got a lot of pep in its step. When I went to pay the fellow for his trouble, he would not accept the money. 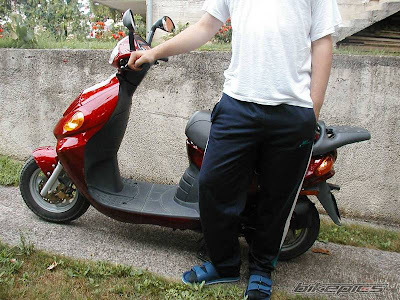 So feeling that I owe his something in return for his troubles I gave him the Dead Ped, It hurts to part with it, but he will use the parts to make other scooterist happy in the long run. And now I have a fully functioning scooter, HooZA!